If you have just adopted a new puppy, or are soon to get one, parvo should be something that you familiarize yourself with. Parvo is an illness that affects dogs, most commonly puppies. And if not treated, it can become deadly. Here at Cypress Animal Clinic, serving the greater Orange area, we want all new puppy owners to know about parvo and to be on the lookout for it, as knowing this information can save a puppies life. Here is what every new puppy owner should know about parvo. Parvo is a disease of the stomach and small intestines caused by the parvovirus. This disease is highly contagious. Puppies can catch it through direct contact with an infected dog or by touching something that an infected dog touched, sniffed or licked, such as a food or water bowl or leash. This disease affects puppies aged six weeks to six months. Puppies younger than six weeks old have antibodies from their mother. By the age of six months, puppies should have received their six, eight and 12-week shots to protect them from the virus. There are many signs of parvo in a puppy. The most common sign, and usually the first sign, is a puppy that just doesn't seem active, normal or wanting to play. Other signs associated with parvo include not wanting to eat, dehydration, diarrhea with or without blood, fever, lethargy, noticeable weight loss, stumbling while walking, weakness and vomiting. If you have a puppy who just seems to be feeling under the weather and something isn't right, you should get your puppy checked out. The sooner the condition is diagnosed, the better the outcome is for the puppy. There is currently no known treatment for parvo. Once your pet has been diagnosed with the virus, they can start your pet on preventative care to help the symptoms and problems that exacerbate the condition. Your vet will work to keep your puppy hydrated and give them the nutrition they need. A course of antibiotics will likely also be started to help prevent infections that can ultimately lead to death in a puppy caused by both the weakened immune system and infections in the intestinal wall. 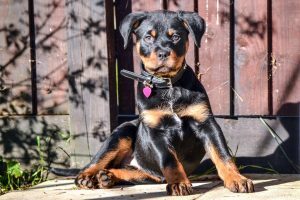 If your puppy shows any of the signs for parvo, or you suspect they may have it, it is important to get them to a vet as quickly as possible. Recovery is more likely when it is caught and treated early. Before you bring your puppy to a vet, call the vet and let them know what is going on and ask how you should proceed. Since the condition is so contagious, some may pull you into an exam room right away or ask you to avoid the waiting room so other dogs don't catch it. If you have a puppy that you suspect has parvo, it is important that the puppy is taken to the vet as quickly as possible. When you need a vet in Orange, contact Cypress Animal Clinic. We can help your new puppy receive the care he or she needs. Give us a call at (409) 886-7050 to let us know you are on your way and we will be waiting for you.